For the times when words or emoticons just aren’t enough, you can express yourself with Stickers, Mojis or GIFS in your instant messages. Select the expression picker in the conversation box. 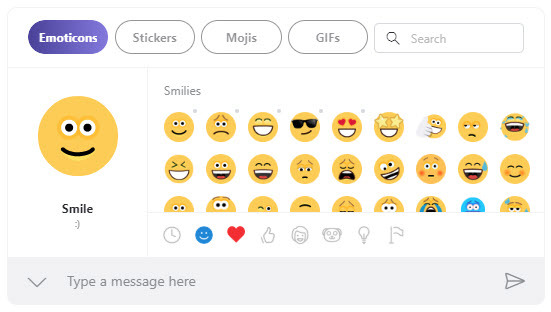 Select the Stickers, Mojis or GIFs button. Browse or use Search to locate the perfect one. Once you select one, you'll see a preview of it. To send, select your Sticker, Moji or GIF again and then select the Send button. The Stickers, Mojis and GIFS you can send depend on your location - some are only available in certain regions. However, you can receive any from your friends wherever you are in the world.